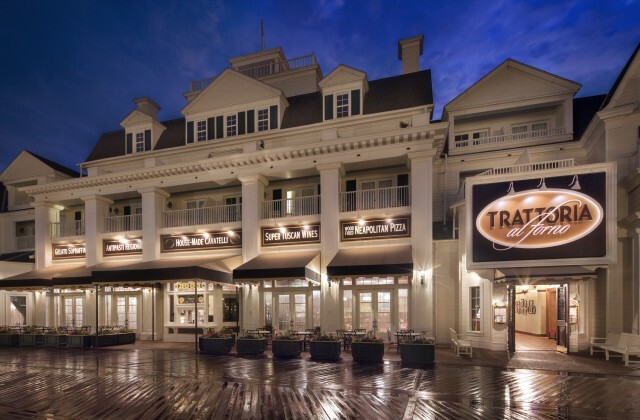 Featuring authentic flavors of Italy’s diverse regions – wood-fired pizzas, hand-crafted mozzarella, and a 100 percent Italian wine list – Trattoria al Forno at Disney’s BoardWalk Resort is inspired by farms in the Italian countryside with an open kitchen and family-friendly dining rooms. 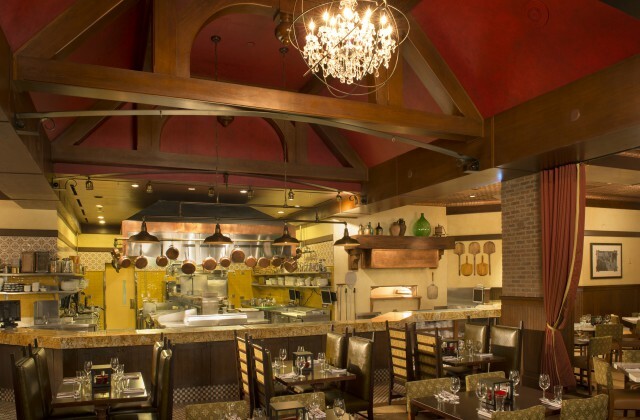 Trattoria al Forno opened in late 2014, elevating the dining and resort experience. Through innovation and creativity, Disney storytelling immerses guests in Old World Italy with charming décor and hand crafted, house-made dishes. The space along the popular boardwalk is completely new, including several smaller dining spaces. 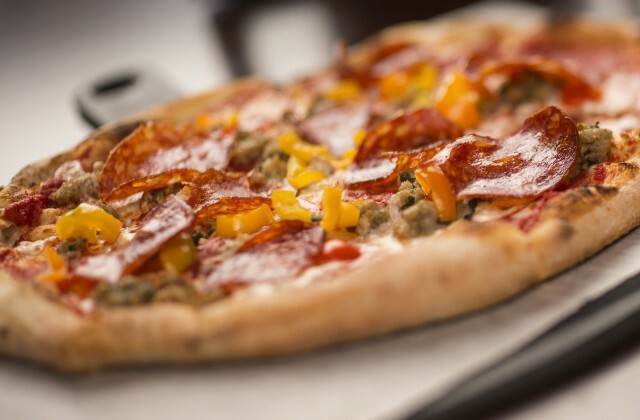 “Al forno” is Italian for “food baked in an oven,” and Trattoria al Forno will feature pizzas in the classic style of Naples, Italy, with simple tomato sauce and fresh mozzarella. Walt Disney Imagineering and Disney Parks Food & Beverage Concept Development have crafted a backstory that builds upon the Disney legacy of storytelling and originality. “The Trattoria al Forno story was inspired by the authentic Italian menu and the rich storytelling of the turn-of-the-century boardwalk setting,” says Missy Renard, Walt Disney Imagineering resorts art director. The story holds that an Italian family ran a modest tavern and boarding house on the boardwalk, which expanded over the years into a popular restaurant. The menu’s mix of authentic and innovative dishes supports the story of the restaurant being handed down, with each generation adding their own touches to the meals and the restaurant’s design. The new restaurant is arranged as a series of separate rooms, starting with the original Entrata, or entrance, where the story begins. An arched brick wall introduces the traditional building materials used throughout the restaurant. Along the back wall, a custom wine cabinet displays authentic regional wines offered on the menu. Vintage family photos line the walls and introduce the generational story. The first room, the Cucina, is designed as the eat-in kitchen for the boarding house guests. The forno, or oven, with its rustic wood mantle and copper hood, is the centerpiece. Next is the Sala da Pranzo, the formal dining room, which showcases the family’s fine silver, glassware and eclectic china in a grand hutch, with two crystal chandeliers above in the vaulted ceiling. The Sala da Pranzo leads into Salotto, or living room, of the old boarding house, now a dining area with tufted circular booths and upholstered chairs. Finally, the Taverna is a secluded dining area located in the structure’s original tavern. Trattoria al Forno showcases Old World techniques, including handcrafted mozzarella made daily and served with local heirloom tomatoes, cavatelli pasta (small shapes that resemble hot dog buns) and genuine Neapolitan-style pizzas baked in wood-burning ovens. A beautiful Italian flywheel slicer slices paper-thin Italian meats, served with a variety of olives and crisp bread. Chef Christian Rumpler admits he has a favorite on the menu – the semonlina tagliatelle all carbonara, featuring long, flat ribbons of pasta (tagliatelle) with rich guanciale (Italian cured pork from the pig’s cheek that is used in classic carbonara). “It’s a simple dish with few ingredients and Italian-forward flavors,” says Rumpler. 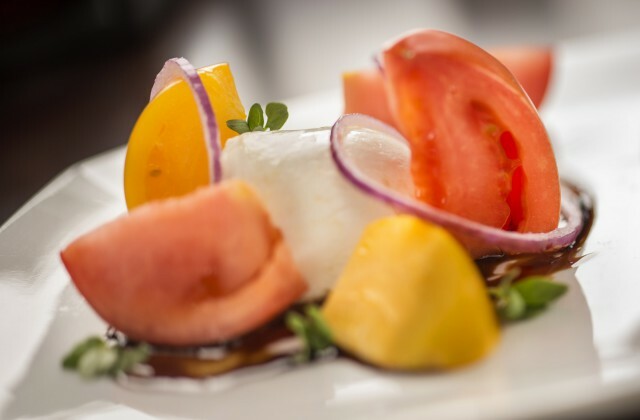 And that’s the secret to most of the menu, he says: keeping it simple, with locally sourced ingredients and fresh flavors. Trattoria al Forno’s chicken Parmesan is thinly pounded, cooked to order and served with fresh tagliatelle pasta. Whole fish is grilled and fileted tableside. The 16-ounce T-bone steak is served Florentine-style with a simple brush of herb oil. Ciabatta is made in-house. The kitchen is proud of the “Sunday gravy,” a simple tomato sauce made with tomatoes, chicken stock, fennel, herbs and a dash of red pepper flakes – the perfect base for spaghetti and 100 percent beef meatballs. Waffles with espresso-mascarpone cream… hard-boiled egg and cheese with fonduta, a warm, cheesy sauce for dipping bread… Parmesan and tomato gravy over soft polenta…press-pot coffee…the breakfast menu at the new Trattoria al Forno offers American favorites along with some classic Italian tastes. “Our guests can get classic American bacon and eggs, but we wanted to give them a taste of Italy, too,” says Rumpler. Wine with food is a way of life in Italy, and Trattoria al Forno’s wine list “takes guests on a historic journey through the Italian wine regions,” says Jason Cha-Kim, beverage manager for Disney Parks & Resorts. Signature cocktails and Italian beers and sodas round out the drink menu, with a signature-blend Italian coffee roasted just for Trattoria al Forno. Trattoria al Forno is open 7:30 a.m.-11 a.m. for breakfast, 5 p.m.-10 p.m. for dinner, and accepts the Disney Dining Plan. For reservations, call 407-WDW-DINE or http://www.disneyworld.com/dine.